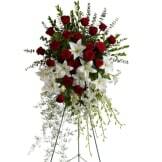 Express your love beautifully and tastefully with this stunning spray of red and white floral favorites. An impeccable choice for the memorial service. 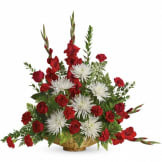 • This magnificent spray includes red gladioli, red carnations, white cushion spray chrysanthemums,and accented with emerald palm and leatherleaf fern. 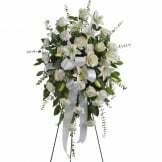 • All arrangements from the Sympathy Store will be hand-designed and delivered by a local florist. • Delivered directly to the funeral home or church. • Measures approximately 27 " W X 47" H.
Flowers will be received by a DellaVecchia Funeral Homes' staff. The Strength &Solace Spray I ordered my brother-in-laws funeral was beautiful. It was delivered when promised and very fresh. The price was very reasonable and I would definitely recommend ordering from The Sympathy Store again. Thank you for doing such beautiful job. Julie V.
This item was nice and I appreciated the ability to have the customized ribbon. It was Waaaay better than the White Lily Basket I also ordered from them! It was very appropriate and lovely. It sends the correct message. I was happy to see that the flowers were EXACTLY what was advertised online. Also, my computer locked up & wouldn't let me finish my order, but the customer service representative I called, was kind enough to take the order over the phone & took my card message perfectly! Thank you! This is the first time I have ever ordered flowers on the internet and I have to say that I am really impressed. My daughter was at the funeral and sent me a picture and the flowers were beautiful. Service was great and also a good value for the dollar! Thanks for taking care of sending my love to a wonderful family in their time of loss. Was completely satisfied with the flowers. They were even prettier than shown in the picture and were delivered promptly. Would order from here again. I was overwhelmed when I saw the beautiful arrangement you made for my Aunt Betsy's service. I ordered it from the photo of selections available but the product was even more beautiful than the advertisement. Thank you from the depths of my soul for the fitting tribute to a wonderfully selfless woman. God bless you all. This is absolutely perfect for men or women and it looks amazing! Thank you so much!!! I ordered my flowers last minute without any guarantee that they will arrive on time.Before the funeral service my flowers were delivered, and made beautifull with fresh flowers and great look. I was very greatful and thank you for your quality and on-time delivery! Outstanding!!! The spray was beautiful. We were very pleased with the quality and service we were given. I ordered this arrangement at 10 AM the morning of the calling for a friend's mother, online through the a funeral home link. It was there before the 2 PM calling began and was the best looking one there and the largest. The family and I were very happy. Thanks so much! They were beautiful and delivered on time thank you so much!!! The flower display was exactly as pictured, very pretty and appropriate for the situation. Thank you so much for getting the flowers there on time and they were beautiful thank you so much!! Was pleased with the beautiful arrangement; however, did not include the requested Ribbon "Beloved Uncle". 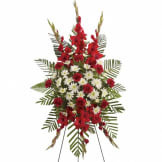 It's always so hard to purchase flowers from pictures, but especially for a funeral. However, this arrangement is absolutely stunning! The flowers were fresh and well arranged. The service was prompt and pleasant. I had to call to change the place of delivery. It was handled with kindness and understanding. I was very pleased with the service and would be willing to use the service again if needed. Thank you very much for the color change of the flowers. I thought the spray was pretty. The flowers really were beautiful. Thanks. The flowers were beautiful. Great job! The arrangement was simply beautiful. All of our flowers are designed and delivered by hand from a local florist in in Southington.